Richie White shows off a 12-pound lunker caught off a bed in Lake Fork this week. In my opinion, there's nothing better than seeing a giant bass in the water and working her up to the point of attacking a lure. Yes, I'm talking about sight fishing. I've been sight fishing for spawning bass on Lake Fork, Texas, for more than 20 years, and I still love it. When I first started sight fishing, I was one of the very few fishermen doing it. 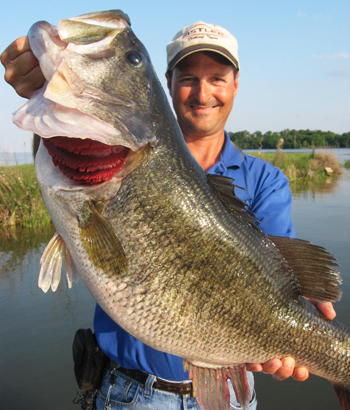 Since that time, tournament pros have popularized it by bringing huge weights of bass to the scales. Now, it's at least a part of most every serious angler's strategy. I fish for bedding bass on Lake Fork from late February through May. Before then, I catch the spawn on the power plant lakes as early as November. So, I have about a six-month season where I can catch fish from the beds. In my 20-plus years, I've developed such a reputation for sight fishing that I usually get booked up for the spring more than a year in advance and even have a waiting list if there are any cancellations. In those 20-plus years, I've gained the experience to write the book on sight fishing. Over the past year, I've done just that. I put together an online e-book devoted exclusively to sight fishing for bass. In the next few articles, I plan to discuss some of the topics and features listed in the book. Go to www.bassfishing.org/spawnbook for complete details. You may wonder what sight fishing for bass has to do with the Insider BASSlog. Well, if you fish during the spring, you are very likely bed fishing. You may not be able to see the fish, but odds are that many of the fish you catch are there because they are spawning. Even if you don't like the idea of sight fishing, if you can understand how to catch them by sight fishing, you can better visualize what may be going on in the shallows where you don't see them. Additionally, understanding likely bedding areas will help you to be in the right places to find the biggest bass in the lake. Bedding bass can be extremely easy or impossible to catch. I believe with the correct understanding, most of them can be figured out. In fact, in the past two weeks I've seen nine bass between 9 1/2 and 12 pounds. Out of those nine fish, I managed to get pictures of my clients holding seven of them. This has already been an awesome spawn, and we still have another month or so to go in Texas. Those of you in Northern lakes have the majority of the spawn to look forward to. Sight fishing for spawning bass always has been, and probably always will be, a controversial topic. There have been anglers opposing it ever since bass fishing became popular. After all, it doesn't seem quite fair to see a fish and prey on its weakness. But isn't that what fishing is about in general — fooling the fish so you can get them in your boat? There is good reason for the controversy. It logically follows that if you take the fish off of the beds, they will not be able to protect the young and those fish will not even make it to be fingerlings, much less survive to adulthood. However, most serious bass fishermen release the fish, so the main issue is the effect it has on the fishery when fish are caught off the beds and then released. Studies have shown that catch and release during the spawn does not harm the fishery. According to an article on Bassmaster.com, "In Southern states, fishery biologists have not detected a negative effect on fish populations where bed fishing is practiced. Only a tiny fraction of bass fry grow to maturity in ideal situations, and forage and water quality are limiting factors, not fishing pressure." In other words, while the controversy is likely to rage on, there are no proven negative effects on the fish or fishing because of sight fishing. As you probably already know, the bass spawn is the process of the female putting eggs into a nest (often called a bed) while the male fertilizes and protects them. This process is very similar to what we see when birds build nests and lay the eggs. Bass will clear out a spot on the bottom of the lake and create an indentation in it to deposit the eggs. Then the bass will stay close to the eggs to guard them from predators. When the water is clear enough to see the fish, bass fishermen are able to take advantage of those protective instincts and catch bass that are not biting out of hunger. This is the basic premise of sight fishing for bass. The eggs are usually too small to see with the human eye, but they can sometimes be seen when the water is clear enough. The ideal depth for spawning bass is around 3 to 4 feet, but they can spawn much shallower or as deep as 20 feet. The bed will usually contrast with the bottom. If the bottom is very light, there will often be a dark bed. Likewise, if the bottom is dark, the bed will be light. Check back in two weeks and I'll have part 2 of "Sight fishing for bass."